In the tenth chapter book in the New York Times–bestselling series, Amelia Bedelia’s aunt Mary has been popped the question, and now Amelia Bedelia has a beach wedding to help plan! But there will be plenty of hitches before Aunt Mary and her fiancé Bob can get hitched: a broken bridge, a mysterious woman, a captain who falls ill, a ripped wedding dress, and even a lost ring. 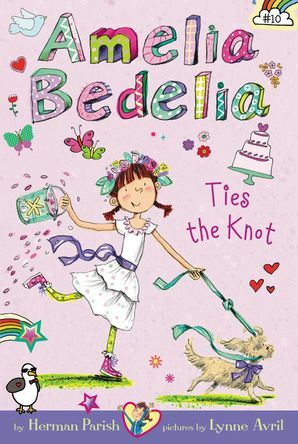 Fortunately flower girl Amelia Bedelia is on hand to help save the day—and to delight readers with her take on wedding planning. The Amelia Bedelia chapter books star Amelia Bedelia as a young girl and feature funny family and friendship stories just right for fans of Judy Moody and Ivy + Bean. The Amelia Bedelia books have sold more than 35 million copies since we first met the iconic character in 1963! Illustrated throughout in black and white. Sign Me Up Get the latest sneak peeks, special offers, and more from HarperCollins Children's Books!